The artists of the Tengenenge Art Community are developing a form language wholly their own, free from the clichés with which art aimed at tourists is loaded, while also creating a type of l'art pour l'art ["art for art's sake"] without any mystical function. Each one of the exhibits is proof of the how the sculptor has come to creative terms both with his or her traditional culture and the world in which he or she lives today. In this respect, the artists' main themes are myths and legends and their effective-ness at the present time. The works are an expression of folklore, tales and sayings, and of beliefs and customs from the traditional tribal community. Figurative and abs-tract elements are found and combined in a repertoire featuring many motifs, while the observer finds himself or herself viewing naturally worked animals as well as i-maginative hybrid figures. The objects, each of which has its own aesthetic, address the observer in many ways. 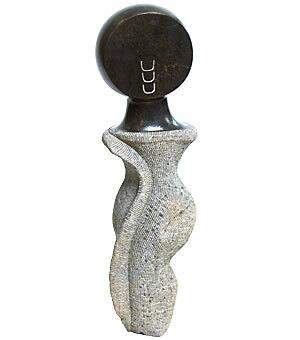 When creating their sculptures the artists of the Tengenenge Art Community mainly work with serpentine stone. Named after the pattern found on snake skin (Latin ser-pens = snake), this type of stone is green to green-black in colour. It can change to a dark brown or yellowish colour as a result of weathering. The stone is ideally suited for sculpting because of its particular toughness and the resistance associated with the works. The toughest type of serpentine stone is the deep black springstone. It is said to owe its name to John Takawira (died 1988), a first generation artist whose chisel looked as if it was going to jump away every time he hit it with his hammer. The artists seldom work from sketches or using pre-developed ideas. Their works are created as they deal with and in conversation with the stone and its recognisable structures. Depending on the working technique, different types of surface textures are created with individual and haptic qualities.